Subscribers to Nintendo Power magazine should be receiving the November/December 1988 issue this week. 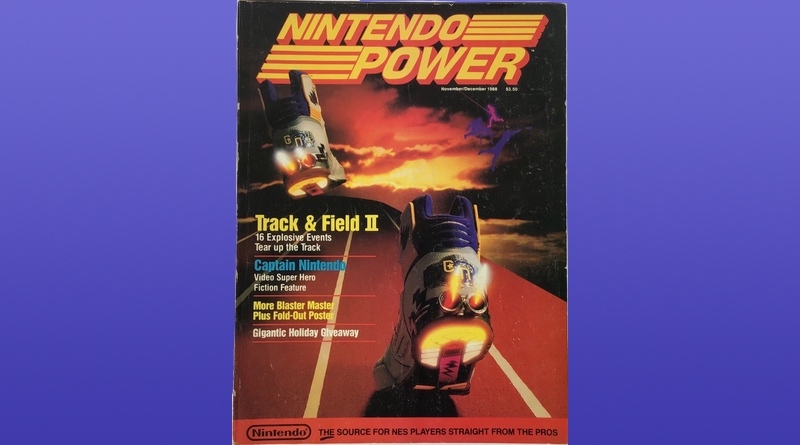 The cover feature is on Konami’s upcoming Track & Field II – the sequel to the popular arcade button-masher released a few years back. We also get a glimpse of Sunsoft’s upcoming Blaster Master. This one should be hitting retail shops soon and it looks like it could really be something special. The graphics look fantastic and the adventure looks like it will be pretty epic. We’ll have our review soon! Are you in the market for some Nintendo gifts that aren’t Game Paks? Well Nintendo has licensed a whole bunch of items that kids might be into. Check out some of the goods! Of course, what better gift could one give to a fellow gamer than the gift of Nintendo Power all year long? You can give the gift of power for only $15! You can soon read the entire November/December 1988 issue of Nintendo Power if you have a subscription! It’s packed with tricks, tips, codes, previews, and reviews of the latest and greatest NES games.